There are two basic smoke management practices (BSMPs) that address how to plan and manage a burn to optimize smoke dispersion. In planning for smoke dispersion be aware of potential smoke impact to areas including those affected by long range smoke transport, diurnal changes in smoke concentrations. Also be aware of residential areas and transportation corridors in which smoke may reduce visibility and impact safety. BSMP 1) Meteorological scheduling and evaluating the impact of smoke from burning both in burn planning and burn operation. Prior to burning it is important to identify smoke sensitive areas downwind of burn areas such as highways, communities, airports, scenic vistas, Class 1 areas, non-attainment areas, etc. Determining meteorological conditions such as wind speed and direction, mixing height, inversion potential, atmospheric stability are also critical to taking steps that will promote smoke dispersal away from sensitive areas and prevent ground level accumulations. Smoke dispersion models may be useful to compare dispersion under different or anticipated meteorological scenarios. However, dispersion modeling may not necessary be an option in all situations. For operations, obtain and use a meteorological forecast (National Weather Service, Spot Fire Weather Forecast or other data source) to inform daily burn decision making and to time ignitions to maximize plume loft and dispersion away from sensitive areas. Verify the forecasted conditions whenever possible with local observations (Remote Automated Weather Stations, on-site or nearby weather monitoring sites, etc.). Also consider the use of smoke dispersion forecasting models, which can aid with go/no-go decisions and are useful for larger burns that have potential for adverse impacts. We will cover recording keeping shortly, but for now it is also worth noting that this BSMP should also entail post-fire documentation of the meteorological forecast and conditions both during and after the burn which influenced the dispersion of smoke. 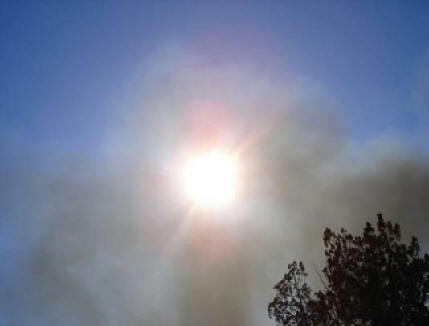 BSMP 2) Monitor the effects of the fire on air quality and document smoke dispersion. Monitoring the effects of fire on air quality can include visual monitoring and associated notes, photographs, aircraft observations, satellite imagery, air quality monitoring data, and post-burn evaluations. Monitoring helps protect the public by providing an assessment of fire activity which can be used to inform future decisions, ensure BSMP 2 is adequately applied, and help to identify potential contributions to an exceedance of air quality standards. Plan and be aware.